Before I begin tonight's blog, I am making a solemn vow to you, dear readers, that nary a bee-related pun shall make its way from my Pushing Daisies-addled mind onto your computer screens. Besides, what would be the point? Tonight's episode already used just about every permutation imaginable of the words "bee," "swarm," "honey," and so forth, and did so with much more aplomb than I could ever hope to. That said, hot damn I missed this show. I haven't been able to rewatch season one since it came out on DVD last week, and I'll admit that I was wondering if the show would hold up, especially after last season's strike-gutted run left things a little wonky. But it seems Bryan Fuller and co. have taken advantage of the show's new stability, offering up a second-season premiere that ratcheted up all of the show's best features. All of our characters are still their lovably tweaked selves: Ned's still boyishly awkward, Chuck's still saccharinely sweet, Olive's still singing (yes! ), Emerson is still making pop-up books, and aunts Vivian and Lily are still clueless and shrewd, respectively. The impeccable, almost absurdly detailed wardrobe and art direction is still in full effect–did you catch the not-quite-honeycomb pattern on Chuck's dress?–and the dialogue still manages to straddle the line between forehead-slapping tweeness and barbed irony. Now I remember why this was my favorite new show of last season. There was also a mystery, as always, and while tonight's honey-whodunit was a little needlessly convoluted, it was also a good example of just how ridiculous the show is willing to get in the name of fun. The hostile takeover of a line of beauty products made with honey, resulting in the sabotage of beehives with mites, further resulting in revenge murder via a swarm of bees, is of course ridiculously fantastical–but keep in mind that this show has killed off victims in vats of taffy and via a scratch-and-sniff book. As always, the mystery is not really about the mystery, but rather about how many punny quips, eye-popping sets, and quirky one-off characters can be squeezed into a mere hour of network television. In fact, if you remove all those elements–but why would you?–all of the mysteries are fairly rote, but often wind up getting tangled up in themselves in the name of originality. I understand that someone had to be around to give our heroes all those clues, but Betty Bee could have just as easily been tonight's victim instead of her friend and partner in crime Kentucky Fitz, therefore eliminating that tacked-on detail about honey tycoon Woolsey Nicholls (French Stewart) being in love with Kentucky and saving us one more silly name to keep track of. Granted, these are still far from being head-scratchingly complex capers, but when a show already so much stimuli–visually and in terms of long-range plot and dialogue–perhaps it's better if the weekly mysteries are a little less twisty. Especially when it seems like we have a few ongoing mysteries to look forward to in coming weeks: the ominous-seeming reappearance of Ned's long-lost father, Lily's confession that Chuck's father (her one-time lover) was Vivian's fiancé, and even the hinted-at possibility that Emerson might have his own Lil' Gum Shoe out there looking for him. Plus, the promise of more Olive at the nunnery–though not permanently, because, as she points out, "It's like a gym membership, I can cancel anytime." There's still plenty going on amid all the pretty colors. Stay tuned. — Good to see the show is keeping up its tradition of hideously mangled corpses. — Ned always has that little-boy posture going on: toes turned in, head stooped, eyes looking innocently up. I can't decide if I want to hug him or poke him in the back and tell him to stand up straight. — Of COURSE that's what Chuck wears as underwear. — That "The Hills Are Alive" moment with Olive made me so happy, I literally bounced in my seat and clapped. Go Chenoweth, go! 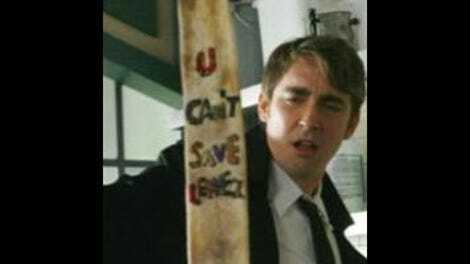 — My fashion/kitch-obsessed friend, who was watching Pushing Daisies for the first time tonight at my suggestion: "Is this show for sale? I want all of it." — Next week: clowns. Ugh, I do not like clowns.